Welcome, lovely listeners and Precious Patrons of Pulp Pamphlet Parlay, to what may likely end up being part 1 of Issue 50 of Comics Squee. 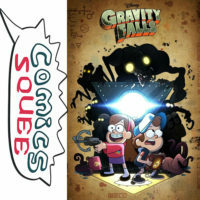 Each podcast our panelists, astride mighty battle pugs, discuss the comic books, graphic novels, and general sequential art geekery that excites them. his is a gorgeous indie comic that Chriss discovered at SDCC 2015. 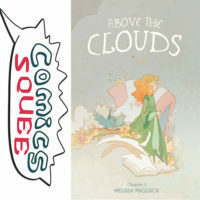 Above the Clouds is a silent comic and it’s very pretty and has a soft watercolor style that sucked her in. It’s set in what looks like Scotland. The main character gets a book from a friend, and the comic silent except for when she’s reading that book – which is about people who live in the clouds until a dragon destroys their home. And the main character is trying to get her friend to finish the story. It is all kinds of amazing. An adventure story set in a podunk, fictional town of Gravity Falls in Oregon. Lots of weird stuff happens. The series, which is two seasons, take place over the course of one summer for the kids as they investigate weird happenings. It’s an awesome animated show with underpinnings of Lovecraftian things going on. Gravity Falls is like if the guys from Welcome to Nightvale decided to adopt Courtney Crumerin. The show is rated Y7 and is for kids, but it has a lot going on. Like, there’s a cypher at the end of every credit sequence to challenge the kids. And there are things that continue through the whole series. Alex has long been a fran of Ed Brubaker’s work and of Bettie Breitweiser’s coloring (for her money one of the top 3 colorists in comics right now). 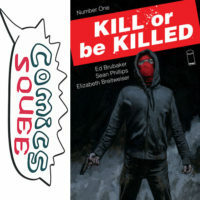 They put out a new thing with Sean Phillips on art called Kill or Be Killed from Image. Ed Brubaker writes a lot of thriller and noir. And honestly it’s better going in if you know as little as possible so you’ll enjoy it more as the story reveals itself. It is noir book with a supernatural element to it. And there is an unreliable narrator and a time scale that jumps around a bit. It’s more about discovery about the world. Kill or Be Killed feels very fresh, and Alex is always there for Phillips’ line art and Bettie Breitweiser’s colors (which are just masterfull). It’s three masters of the genre collaborating together and we would urge you to just pick it up and go along for the ride. Supergirl is fantastic and fun. This version of her, John would describe as a coming out story. Kara has been hiding and not using her powers because that’s what her foster parents wanted. She was sent to Earth to protect her baby cousin, but her flight got ‘delayed’ and she got caught in the Phantom Zone. So she arrives when he’s already grown up and doing super stuff. And she leads a normal life, hiding who she really is, until the plane her foster sister is on is going to crash and she saves it. And she feels so alive that she doesn’t want to go back to hiding. 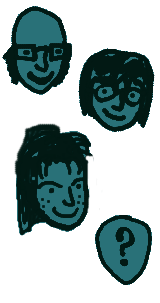 Each story explores finding your identity. From Kara having anger issues to trying to balance too many things in her life while figuring out show she is. And each job does a good job of ‘trying to figure out what your identity is’ as far as self exploration. While still having a bit of that monster-of-the-week kind of thing, since it’s a superhero show. So you’ve got the Phantom Zone prison break angle. 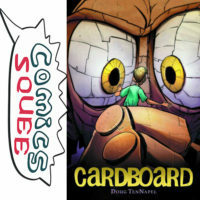 hese two books dovetail, where one is about a rocky space giant who goes into battle against his father’s wishes and gets captured and hidden as an island on a planet, and the other is about a family trapped on an island that turns out to be the giant. They’re by Doug TenNapel, who did Earthworm Jim stuff (the video game in the mid ’90s). Each book is a stand alone story, but they are parallel stories. Each does a good job of presenting a world in one volume without needing the setup of a bunch of other stories. They’re published by an imprint of Scholastic, so they’re meant for young readers. Good books for 7 and up, that do a good job of building an entire world in just, like, 120 pages. 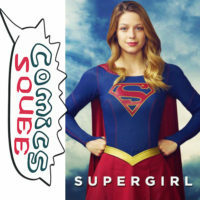 General tangential silliness ensues as we close out Part 1 of issue 50 of The Squee. Tunes in next week for Part 2, with our Question Time query where Chriss surprises the panel by inviting them to ask HER questions. And we give our forecasts of what we’re looking forward to next.